Here are the list of legal employment agencies and job opportunities open for Filipino workers in Asian countries like Malaysia, Vietnam and Taiwan. They are looking for factory workers, caretakers, technicians, engineer and many more. 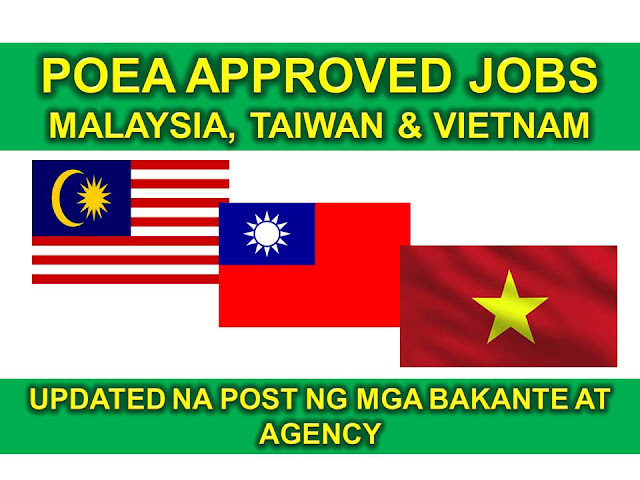 The following jobs are meant to be your guide to know the legal employment opportunities which are approved by POEA. Job applicants may contact the employment agencies for further inquiries and information or to apply for the job. The jobs below are assigned to legal employment agencies Each jobs are linked to their respective employment agencies assigned to process visa and work permit. Applicants may also check the job websites of the agency for more convenient online job application. For interested job applicants, you may visit or contact the agency through their company job website, or Workabroad or Jobstreet job website as provided on their contact information. We strongly encourage job applicants to report any illegal collection of placement fee. As per POEA, there should be no placement fee for household service workers like domestic worker or family drivers. For other jobs the placement fee, if any, shall not exceed the 1 month equivalent salary.